Wi-Fi and parking are free and all units feature full kitchens and multiple bedrooms at the non-smoking Holiday Inn Club Vacations Holiday Hills Resort in Branson. Holiday Hills Resort is made up of multiple three-story buildings with a total of 514 exterior-entry condos with floor plans ranging from two to three bedrooms. Each traditionally decorated unit features a fully equipped kitchen a living area with a flat-panel TV and sofa bed and a patio or terrace. Wi-Fi is free and some rooms feature washers and dryers; others have access to the on-site guest laundry facilities. Guests can play golf then grab bites at the on-site restaurant which serves all meals. Active types stay fit in the gym and families enjoy the four seasonal outdoor pools and one indoor pool. Other family-friendly activities include a game room movie theater playground and disc golf course. A business center and free parking round out the conveniences. 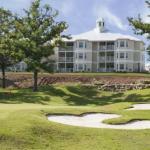 Just off Highway 76 Holiday Hills Resort is three miles from the Branson's Main Street. Quaint storefronts and cafes line the streets in town where guests also find the Branson Scenic Railway Branson Centennial Musuem and Branson History Museum. Some popular venues with 15 minutes include Sight and Sound Theatres Hughes Brothers Theatre and the Dutton Family Theater. Outdoor adventures include Table Rock Lake and Branson's Promised Land Zoo each a 20-minute drive. The closest major airport is Springfield-Branson National Airport 54 miles north.